Now that festival fever is upon us once more, I thought I'd preserve this little piece of festival history. In the early years of MFAB we used to pin this on the doors of the various pub and club rooms we used for meetings. After a few years, the picture came closer and closer to the reality. 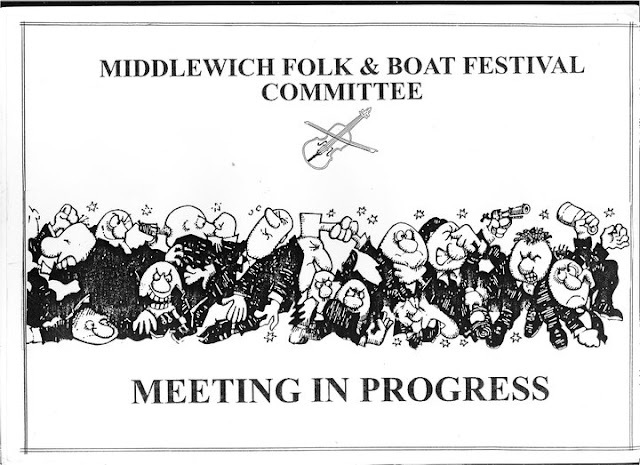 Ian Murfitt I remember many meetings like this one, the exception being the end of year financial meeting when we all stared at the floor, buttocks clenched, awaiting the pronouncement of the treasurer, whilst the rest of Middlewich muttered about what we did with the vast profits. Stephen Dent What did we do with the vast profits? Oh, I remember now everyone in Middlewich made money except us! Ian Murfitt Someone had a go at me last week about it. Working on that festival cost me a fortune, but Middlewich knows I was pocketing the vast profit, generated when they spent all weekend in a pub. Stephen Dent Yes I feel sorry for the new organisers. Editor's note: The references to the 'new organisers' comes about because 2011 was the year that the Town Council took over the running of the festival after it had run into financial difficulties. The 'new' name, 'Middlewich FAB Festival' dates from this time. Lizzie Rosenfield-Boyle Oh Dave I could tell some stories about meetings I’ve attended. And the hours I put in - and the sheer pleasure I experienced being a part of the team running said hugely successful festival. And did I stand accused?! Of course I did ... yeah right. See you in the Bahamas! Martin Rivers The old saying "no good deed goes unpunished". Paul Williams In the early years we depended damn near entirely on John Mcateer coming up with grants to kickstart the whole thing. It was certainly not going to pay for itself. Let alone let organisers put anything in their own pockets. It was always on a knife’s edge. People simply won’t believe you’ll give your time for nothing and there are enough dodgy accounting stories where that has been the case that they feel justified in their opinion. Not true of course. Community spirit abounds everywhere. Not least at the Middlewich FAB. Dave Roberts Johnny Mac was, and remains, my all time hero. Most people will never know how much he did for this town with, as you say, pioneering work on the Folk festival and vast contributions of time and energy to help make the local football club what it is today. I always had the perfect, time-honoured phrase to use on those who'd sit and mutter into their pints, criticising the way the festival was run without, of course, ever volunteering to help in even the smallest way. It's 'Non-bowlers off the green'. Even the thickest knuckle-dragging member of the Keep Middlewich Miserable Campaign could understand what I meant, and it annoyed them no end. Which is always good, of course. I take my hat off to the organisers of the FAB festival it must take some hard work and organising thank you all .